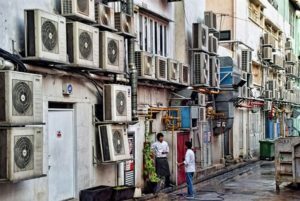 Air conditioners are a central part of the daily lives in lots of homes around the country. The heat wave that sweeps through the country every few months necessitates the need for having conditioners that regulates the warmth or coolness of air that enters or leaves your home. Most homeowners incorporate eco-friendly air conditioning designs and structural changes into their homes during the construction phase. Even then many other homes still need to have an air conditioning fitted. Choosing Air Cons. Air conditioning is very critical particularly for kids, pets, the elderly and those who aren’t feeling well. There are lots of air conditioners in the market with different designs and efficiency. Needless to say, the pricier air conditioners tend to offer greater functionality than the cheaper ones. You have to consider the size of your house, the design, your personal preferences, and costs when choosing which air conditioner will work for your home. Typically, the conditioners cost between $500 and $4,000. Friedrich Kuhl Plus. This air conditioner is also known to act as a heater. It works optimally when the temperature ranges from 50 degrees to 150 degrees. It’s well accomplished at regulating the temperature at your home in hot August days as well as chilly September nights. Its BTU unit is roughly 30% more than the standard government requirement. The air container has six different colour varieties to choose from. The air con is heavy grade and made with aluminium fins, copper tubing and retails at about $1000. GE 115 Volt Room Air Con. This Energy-Star rated air con offers you about 12,000 BTUs with an EER of 10.8. This capacity is what makes it one of the most efficient air cons in the market. The federal standard for EER is about 9.8. This air con is fitted with a 24-hour timer to help you regulate its functioning. It is also equipped with a three-speed fan and an easy-to-access lift out the filter to help maximise air quality and flow. Kenmore. This is a heavy duty air con that can safely regulate 1600 square foot of space at one go. It delivers about 25,000 BTU which is among the highest among air con units. This Energy-Star rated unit has a thermostat too which enables it accurately regulate temperature. It also has an active timer which equips you to set the start and end time for the unit to run. It retails at about $590. Keep in mind that it is best fitted upstairs for it to regulate the entire house properly. Whirlpool Resource Saver. This unit has 6300 BTU with an EER measure of 11 which is about 13% higher than the federal standards. It has both a remote and a docking system that monitors and regulate the temperature. It also has a 24-hour timer which allows you to set what time it should control the heat so that you can lower the energy bills. The whirlpool resource saver retails at about $350 a piece. Saving Energy on Air Cons. First, you can keep the AC lower at night and raised during the day. You can also use portable units that only regulate the area that you need heated or cooled. Make sure you close off the vents, service your unit and also check the ducts regularly.